When was the last year where a team won the Stanley Cup when their best player was a total one-dimensional player? Let’s look at the Stanley Cup Winners from the past 15 years and see who their leading scorer was and who their captain was (since Ilya doubles as the captain of the Thrashers). Sorry, Montreal. The 1993 Cup wasn’t within the last 15 years, so I guess I can’t list the Canadiens. Funny how these things work out. Does Kovalchuk’s name belong with any of the players not named Stephane Richer on that list? The closest anyone on this list comes to being labelled a one-dimensional player is Martin St. Louis and he’s still a +16 for his career. Kovalchuk is only now enjoying his first plus season, which I think, in part, is due to Nik Antropov's defensively conscious presence (career +70). Kovalchuk is a career -82, which is horrible considering the massive amount of points he puts up. In his defence, his worst two plus/minus years were his first two in the league and the majority of his career the Thrashers have been pretty bad, but I don’t think I can exonerate him that easily. He’s totally invisible in the defensive end and I don’t think he can spell back-check. Now I’m not suggesting that any team with Ilya Kovalchuk as a member will never win a Stanley Cup. But when you allocate such a large portion of your cap space to a player that is one-dimensional the rest of your team suffers, making it much harder to win a championship. He is going to command a ridiculous deal (something like 10 years and $8+ million per) and can only do one thing! The Leafs already have a fairly one-dimensional player (Phil Kessel). I only say fairly because while he is by no means defensive, he does back-check hard and has enough recognition to tie up loose players when the Leafs are scrambling. Plus, he’s still so young that he hasn’t fully mastered the concept of being a two-way player (maybe he never will, just hoping he does). Ilya will turn 27 this year and has shown no interest in even engaging in his own end. Spending $13 million of your cap space on both Kessel and Kovalchuk doesn’t seem like the safest thing to me. Additionally, did you see any pure offensive players on the above list? These types of players are often important elements to a team (e.g. Fedorov in 1997, 1998), but in the cap era when you have to spend a large percentage of your available cap on these players it reduces the likelihood of filling out the rest of the roster with quality players. So when the player you do spend that much money on only does one thing then it basically means you have to sign a more defensive minded player to play with him just to negate his poor defence. If you allocate your money to someone like Pavel Datsyuk then it means that not only do you get a dynamic offensive player, but you have someone who plays well enough defensively that he can actually be considered the defensive conscience of a line! I’ve stated before my distaste for these super long-term deals and I think this is a deal that can potentially harm the Leafs long-term, unless Kovalchuk becomes a complete player. I’m not convinced that can happen. Sure, they’ll make the playoffs and maybe win some series, but a championship? Nah. And that’s all I care about. I’m not from Atlanta. I won’t be happy with a first round sweep (not that anyone in Atlanta even noticed). But he is only 27. Steve Yzerman was a points machine early in his career and didn’t buy into defence until Scotty Bowman took over as head coach in 1993 (when Yzerman was 28). Yzerman then became one of the best two-way players of all-time. If the Leafs sign Kovalchuk then this is what I will tell myself could happen. Would I instantly love Kovalchuk and defend him vehemently? Maybe. I’ve got to protect my psyche. While I am resistant to Kovalchuk signing in Toronto, I do think there is one great fit for him in the league. Watching the Leafs play the Kings on Tuesday made me realize that Ilya Kovalchuk would be a perfect addition to this young, fast, and quickly maturing team out of South California. Right now their main star is Anze Kopitar, who is a big body player who perfectly complements the fast and peripheral style of Kovalchuk. Furthermore, the Kings have a very deep team filled with excellent two-way players such as Dustin Brown, Ryan Smyth, and Jarret Stoll who can bring balanced to the pure offense of Kovalchuk. Kovalchuk's addition would bring an explosive offensive force to their line-up, but wouldn’t be as detrimental defensively because of these types of players already under contract. Kovalchuk on this team gives them a marquee player that can make them a legitimate Stanley Cup contender as early as next year (although more likely two). Chicago-LA would be a fun rivalry. Really fast. Really exciting. Tons of snipes. Bringing in Kovalchuk, either at this trade deadline or via free agency would protect the Kings team from regressing next year. This is a very young team and it is unlikely that all of their young players will enjoy the same smooth progression that they are achieving this year. St. Louis is suffering from this type of setback after a promising season last year where they achieved a playoff berth. Now they are back to being bottom dwellers. Ilya Kovalchuk can help take the pressure of these young players and allow them to develop without as much attention and demand for production. 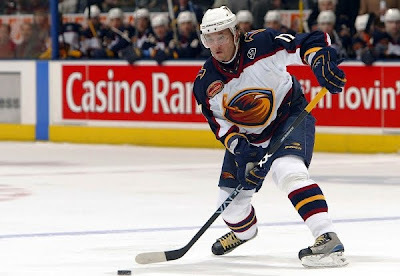 Plus, Kovalchuk in LA is great for the game. He’s an exciting player that can help grow the game of hockey in LA as the young team grows with them. LA loved hockey when Gretzky played there and having Kovalchuk as the star fits with the glamour of California. I can see hockey getting big in LA again if the Kings return to prominence with a fun team. California wants to see a show. They’re willing to watch anything that’s talented. Will they win a cup with Kovalchuk? It remains to be seen. But they have a better chance of winning a cup with Kovalchuk than the Leafs do. I enjoyed your exclusion of the 1993 Stanley Cup champions, that was a lock-out year right?? Maybe not... But I agree with your prognosis of the Leafs predicament, although Kovalchuk is an offensive dynamo, his skills need to be complemented, and for a team like Toronto, they wouldn't have the cap space or current farm system to surround him with talent in his prime years. It's a known fact that the current Leafs roster is 80% filler (Jamal Mayers?! Certainly not! ), and the game they have to play is a patient one. It was exciting getting Burke as GM and watching him totally re-construct Ferguson's Leafs, but patience is not Burke's game either, and I think one of his biggest moves will have to be avoiding the temptation of Kovalchuk. I love Burke. But he scares me.